I am yet to come to terms with the rationale behind diplomacy; giving a law-breaker the chance to address a lawful and honourable Assembly that thrives on purity. I am of the view that hypocrisy is becoming a culture or rather inactiveness has become unlawful. If UN that set a sheep on a race would allow a lion to devour it without warding off or fighting to protect the sheep; I bet UN is simply making mockery of the development it preaches and the stability inclusive. In 2007, this honourable Assembly stood firm and made a declaration without compulsion or influence; the declaration gave Indigenous People the rights to aspire for self determination. This declaration was to avoid the use of arms in pursuance of self-determination which was prevalent in the early days of the world. This charter was applauded by all and sundry but today; it seems there is no guarantee to that Charter; either it was a fraud or UN was fulfilling all righteousness. Indigenous People of Biafra took advantage of the Charter and thrived on it; adhered to the last letter of the articles as contained; soaked in the richness of the declaration and poised to make a difference but was not only betrayed but made to suffer injustices without a visible action or rebuke from the honourable Assembly that propelled the actions of the people of Biafra. It is therefore imperative to ask; is UN blind that they cannot see the genocide going on in Biafra due to deep engagement with the Charter made by this Assembly. Is UN deaf that they cannot hear the groaning and moaning of a people held down at the point of unlawful death and unlawful incarceration? Though UN has done a lot to better the world; I question their commitment to better this part of the world inhabited by Biafrans. In 21st century an Emperor that is greater than international and local laws lives and that Emperor sits among them. That Emperor would soon mount the stage and read what was compiled for him and what impression does he create? When this Emperor (Buhari) in his Empire (Nigeria) said that he would not obey the order of two competent courts of jurisdiction ordering him to release Nnamdi Kanu the leader of Indigenous People of Biafra; I had thought the end had come for him but disappointedly; I never knew the world has gone wrong. This Emperor flouted court orders, narrowed rule of law to nothing and destroyed the constitution he took an oath to uphold. When the court is attacked and disobeyed; the hope of common man is thrown to the wind that would drift it away to nowhere. That Emperor will mount the world stage and the world would listen. It is really a thing of disappointment to know there is still room for barbarism in this honourable UN Assembly. While this is the case; this Emperor went further to kill and commit genocide against the dissent voices that stood to establish rule of law once more. He kidnapped and incarcerated the people of Biafra; he forced them to disappear and ordered damning military action. He sacrilegiously murdered them on their prayer session and despite the fact that it was digitally documented and cannot be denied; this honourable Assembly never condemned such crime against humanity and allowing the culprit to speak to the world; a role model? When such man is allowed to associate and speak in the midst of civilized world; what is UN propagating; that we learn and listen to such a barbarian? Before Muhammadu Buhari addresses the UN General Assembly with a prisoner of conscience in his dungeon back in Nigeria, he must purge himself of barbarism. Before he addresses the world; he must be made to know that rule of law is one basic factor to a better world development. Before he is given the license to address the world; he should know that detention outside the law is slavery which depicts barbarism. He must be called to know that he is the number one enemy to the development of the world with such prisoner and military action against a peaceful and unarmed people. Buhari should go back to Nigeria and wash himself of crimes against humanity; he should free the leader of Indigenous People of Biafra and stop ISIS-like execution of lawfully agitating People of Biafra. The motive to allow a man that has subjected humanity to inhuman torture and treatment on the floor of UN Assembly is a miscarriage of justice and sign of the failings of the UN. The people of Biafra are part of UN by virtue of conventions and laws that recognizes Indigenous People. Therefore, there should never be bias in handling and compulsion of any member State that lacks discipline. Finally, I have heard the word ‘sovereignty’ from Nigerians and they have anchored the reason for their crime against humanity on it. Buhari has ordered that unless Nnamdi Kanu renounces his self determination quest; he would remain in detention and the unarmed people of Biafra will continue to die in the hands of his soldiers. Having said this and lived it; it is crucial to sue for action because sovereignty is not a guarantee for crime against humanity. Sovereignty is not a plane for abuse of human rights and until Buhari is compelled to be lawful; the people of Biafra will remain a species of terror. The people of Biafra must not be allowed to continue to suffer this second genocide after the first genocide that claimed over 5million innocent lives of the people. Hence the continued illegal detention of Nnamdi Kanu the leader of the Indigenous People of Biafra is the trigger of this genocide; consequently, the agitation for his release at peak. Buhari should be forced to release a prisoner of conscience before addressing the civilized world because such prisoners are seen in dark ages. Nnamdi Kanu is a victim of religious bigotry or fanaticism. The people of Biafra are killed and made to suffer the effect of a failed State they never took part in. 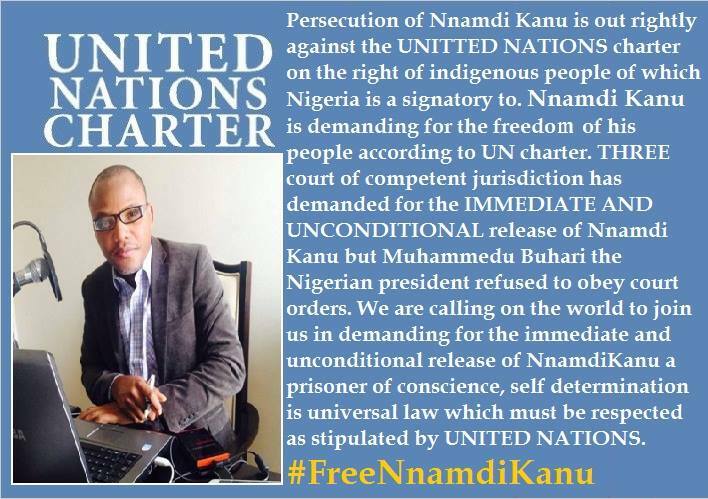 while I urge UN to compel Buhari to release Nnamdi Kanu in keeping with the international obligation as made by the UN General Assembly; it is crucial that the Assembly look into Biafra question as human right is at stake.